Whether you know it or not, we have a small collection of venomous animals at the Museum. Yes, I do have to handle them and yes, we do take them to schools – in very secure, locked cages. This isn’t recreational handling, either. 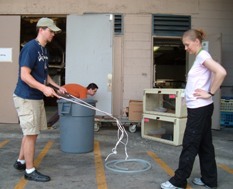 I use proper safety tools, like snake hooks and tongs; large, heavy-duty containers; and, of course, a back-up person. There is a risk of getting bitten – just like there is a risk of getting beaned in the head with hockey puck. While I have experienced the latter and do not recommend it, I have been fortunate enough to avoid the former. Venomous animals are dangerous. They deserve respect, just like all living things. Okay, so maybe a little more respect, since some of them can kill you. I have always been fascinated by dangerous animals. But keeping them is another story entirely. Not so much the danger…okay, maybe the danger. I haven’t worked with a lot of different, venomous species, but those that I have been exposed to have been both awesome and frightening. 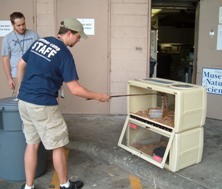 My first training exercise involved pulling a young Black Forest Cobra from his terrarium and putting him into a tall trash can (Rubbermaid makes some tough stuff!). The first part was easy. He rode the hook, staying loosely coiled, and was alert while I settled him into the can. After I did the hard part – cleaning his terrarium – I had to pull him back out of the can. Well, he must have seen this coming. Have you ever played with a Jack-in-a-box toy? The nice part about the toy is that there is a musical cue when it might pop open. Well, not so with the snake. Just as I would get the hook over the edge of the can, this 5-foot snake (not so little) would pop straight up, looking right at me. Slightly nerve-wracking. So, I moved to the other side, but sure enough, here he comes, straight up with his head about 6 inches over the edge of the can. Needless to say, I did need help getting him out – it was my first time. I remember being really nervous and very hyped up after that – I still remember the snake fondly. Since then, I have mainly worked with native species of venomous snakes. Not to say some of ours aren’t as ornery as the cobra, because I can personally vouch for some bad-attitude rattlesnakes. All in all, I would have to say that I enjoy working with venomous snakes. It was not something I had signed on to do, or was even a goal. The opportunity appeared and I thought “why not?” I have to admit, it is kind of fun when people ask my husband, “what does your wife do?” and he says, “she plays with rattlesnakes.” He does go on to explain, but that first expression is too funny! Now add in another factor – pregnancy. No, not of the snakes – mine. This adds another whole level of risk that I am not willing to take. Thus begins an interesting journey in training another (read: willing) person to do the job of handling our hot species. 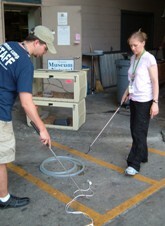 During summer camp, the Animal Room is very fortunate to have an intern. For the past few summers, one of our interns has been Stefan. Stefan attends Texas A&M and is a tried-and-true herper. His Herpetology field class, projects and summers with us have given him a lot of exposure to snakes, turtles and amphibians. I am confident in his ability to handle our venomous snakes – even if he does get really excited about it beforehand. Put him in front of the snake with a hook in his hand and he is all business. This works out great for us during the summer. For the rest of the year, our current part-time Animal Technician Ben is the other person you will see in the pictures below. 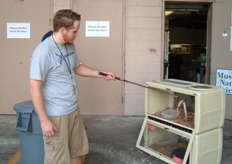 Ben is a certified Veterinary Technician and very excited about being trained to work with our hot snakes. In the pictures, you’ll see me showing Ben how to use the hooks to pick up our practice snakes (rope and plastic tubing); Ben showing me how easy it is; Stefan showing Ben how he hooks one of our copperheads; and Ben showing us how he can do it too. The fun part is that once the snakes are aware of what we are doing, they are less apt to “ride” the hook. They get more active, move away from the hook when touched and even get cranky after a few go-rounds. Both of the “boys” are very capable and I do not doubt in their abilities, but…I am a natural worrier. The hardest part is standing back and watching, trying not to hover or be a backseat director. We have safety protocols, are near several excellent hospitals and have emergency phone numbers posted nearby. Plus, the Houston Zoo is next door. Safety first! Stefan making it look easy as Ben learns from the sidelines. Ben working with a copperhead, while Stefan acts as back-up and offers tips. 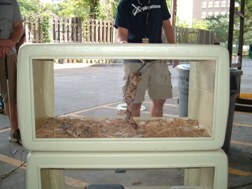 From the snake’s point of view, Ben hooking one of our copperheads. What an awesome job! For people other than me 🙁 I get myself bit all the time. It’d be a disaster if I had to work with venomous snakes. But still it looks like a great job!